My interest in the axe factory at Mynydd Rhiw began when I was at university, reading a paper in the “Proceedings of the Prehistoric Society” by an archaeologist named Chris Houlder. In the late 1950s, Houlder and his colleagues had discovered and excavated a series of pits on the north side of the mountain, revealing them to be quarries dug at the end of the Stone Age (c. 4000 – 3000 BC) to extract a rare fine grained stone from which axes, knives and scrapers were made. Geological analysis of the stone showed that Mynydd Rhiw axes had been passed from hand to hand across Wales, appearing as far away as Flintshire, Glamorgan and the Borders. The report which Houlder produced suggested that the Stone Age working in the area was confined to the few pits he had discovered and left a nagging question in my mind – were there more to be found? In June 2005, on a spare afternoon I tried to answer this question by walking the flanks of Mynydd Rhiw, in search of further signs of prehistoric quarrying. All I found was a single rock outcrop, about 400m from Houlder’s pits, which looked as though flakes had been removed from it. Even so, it was enough to encourage a group of geologists from York, Cardiff and Bangor to visit this new discovery in August 2005. By the end of their visit they had spread out from the initial rock outcrop and had located a seam of fine grained rock extending northeast / southwest along the east side of the mountain – but it wasn’t the same seam that Houlder had proved was quarried in the Stone Age. This left us with the problem of proving that the new seam was also quarried. A team from Amgueddfa Cymru – National Museum Wales returned to the seam twice in October 2005 and May 2006 to map out the geological evidence, and in the process we discovered a line of shallow scoops in the hillside which suggested that it had been quarried at some time in the past, although we couldn’t be certain when. More importantly, at scattered across the hillside we found a handful of flakes of rock of a type characteristic of Stone Age working, and a few hammerstones – the tools which would have split the flakes from the parent rock. 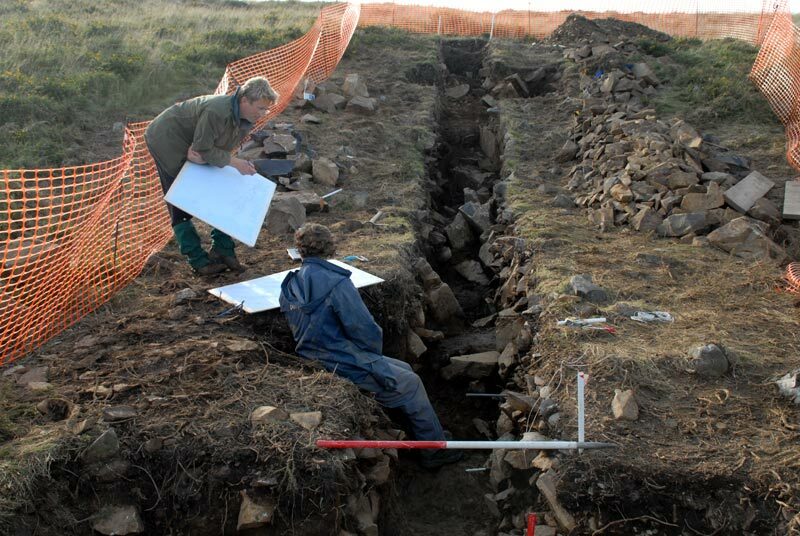 It wasn’t enough to prove conclusively that this new seam had been quarried in prehistory, but it was enough to prompt an excavation which we carried out in September 2006. The excavation was as much a geological as an archaeological project. The seam we were investigating was formed when molten rock forced its way up to the surface, searing the edge of the local rock to create a thin fine grained band. Understanding the detail of this geological sequence took a lot of time and was vital to our investigation of the archaeology. But the main questions we hoped to answer were: was there conclusive evidence that our seam had been quarried; and if it had, when had the quarries been dug. Lastly, we wanted samples of the rock that had been quarried for later analysis. 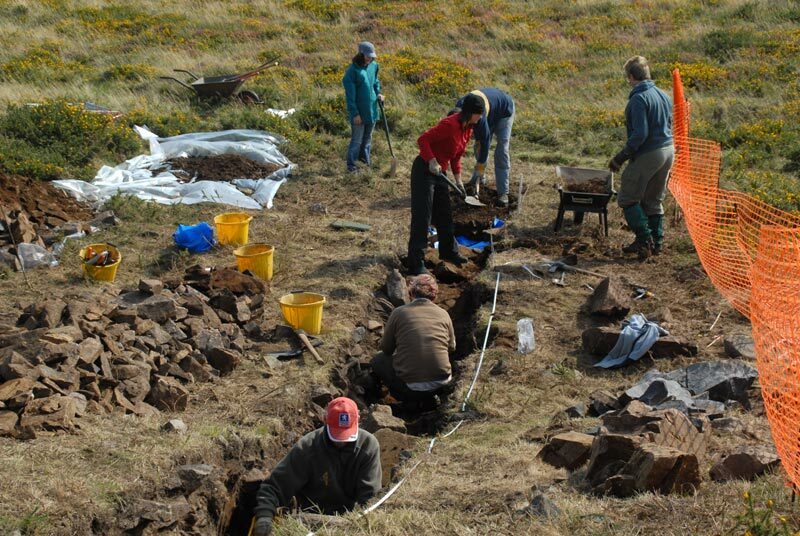 We were a small team, between three and four people on most days, and our trench was about 19m long. This meant a lot of earth and rock shifting for each of us as we dug down. Nonetheless, we quickly found the evidence we were looking for – a collection of thin stones flaked in prehistory. This encouraged us on throughout the next three weeks of work. 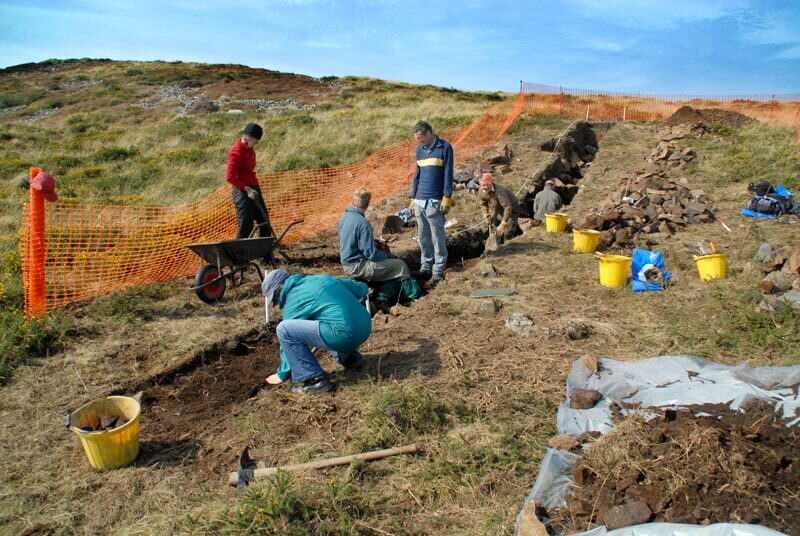 At the end of the season we had uncovered 3 separate episodes of quarrying in the trench. At the higher end it seems that people were content to haul loose rocks from the hillside, working these into suitable shapes. In the middle of the trench was a deeper scoop from which rock had also been removed, and this contained our most precious finds – charcoal which will be radiocarbon dated. At the lower end of the trench we found the deepest scoop of all, and this seems to have been dug to get at the finest rock in the area. Interestingly, there were no surface traces of quarrying immediately above this scoop, which raises the possibility that there might be many other quarries beneath the soil on other parts of the hill. There was no shortage of finds from the excavation, but our finest was a stone axe roughout – an artefact which proves that our rock was quarried during the Stone Age. The next step is to characterise the rock from the quarry and to try to match this against some of the thousands of axes discovered across the British Isles. Who knows how far the axes from our quarry were distributed? 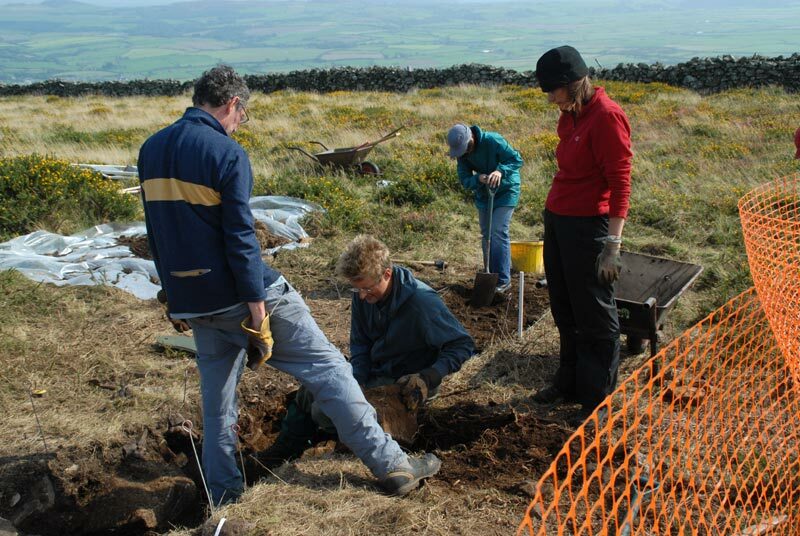 It will take a lot more work before this question can be answered, but in the meantime, we have already gone a long way towards building a picture of life on the flanks of Mynydd Rhiw at the end of the Stone Age. It seems that Houlder’s pits were just part of a much more extensive quarrying enterprise in the area. For the most part this involved simply grubbing rocks from the exposed hillside, but doubtless, Houlder’s deeper pits are just a small sample of the many that would once have dotted the eastern side of the hill. Indeed, for a time, the flanks of Mynydd Rhiw would have been pitted and scarred by quarries that would have been visible for many miles. A far cry from the peaceful heather and gorse-covered mountain of today. The people who quarried the rock probably lived within easy reach of the mountain, perhaps as far away as Abersoch, but probably more locally. There are several tombs in the vicinity of Rhiw, which are probably contemporary with their work, and these suggest that settlements were nearby, but we do not know for certain. Wherever they came from, it seems likely that the people were only occasional quarrymen, for the most part spending their lives as farmers and herdsmen. It is probable that they only turned to the quarries when they had need of its sharp stone, and probably only traded that stone further afield when a rare chance occurred. A thousand years after the end of the Stone Age it seems that the quarries were largely forgotten and the mountainside had been transformed again, this time by the setting up of prehistoric fieldwalls which now form a criss-crossing pattern across the top and eastside of the mountain. How old these walls are, and how extensively they spread across Mynydd Rhiw is a project for another season. Many thanks to Dr Steve Burrow, for this report.